It might add quotes that are inconsistent with the rest of the file. If you're collaborating on the CSV file with others, their Excel version might have different defaults and produce incompatible output. Even if you're the only one working on that CSV, you can forget about clean diffs and sensible atomic commits to your version control system. The only solution is not to overwrite CSV files you've opened with Excel. Use another tool designed specifically for dealing with CSV or edit the file manually in the text editor of your choosing. 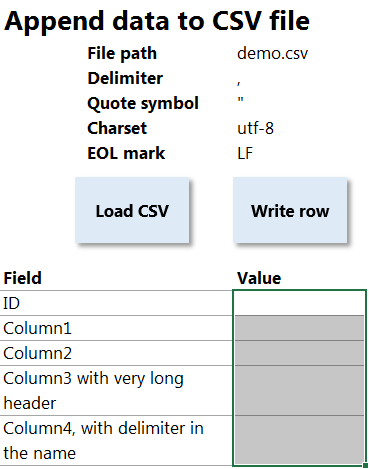 I wrote a small helper utility to append data rows to the CSV files from Excel that ensures you won't mess up the existing data. This is a one-day hobby project, and Excel serves more as the UI toolkit and runtime environment than as the spreadsheet application, so you should be careful if you decide to rely on that code. The project is licensed under the Apache License, Version 2.0. The resulting application, packaged in a workbook. The code is pretty straightforward so I'll highlight only the most interesting parts. Visual Basic for Applications is a hopelessly outdated environment. Unicode support can be achieved only with the help of COM interoperability, namely the ADODB.Stream object. This object provides a very comfortable interface for reading and writing text files in a bytestream mode, and also handles character encoding nicely. Appending to a file is done via combination of seeking to the end of stream and writing the new data. I'm not exactly proud of how CSV string manipulations are implemented in the code. If VBA would've provided some nicer regex capabilities or a CSV-aware library it would've been better. I know about VBScript.RegExp, but it's an overkill for a small task my app was created to accomplish. Current implementation can not handle a quote symbol in the middle of the field value. This is a known bug. This the main and the only UI my utility offers. Inputs and buttons are meant to be self explaining. No value conversion is done when saving - the value of the cell is written as is, quotes are added if delimiter character occurs within the value. ID,Column1,Column2,Column3 with very long header,"Column4, with delimiter in the name"
The project is published for educational and archival purposes. I'll be glad if you'll find any use for it.